A cup of festive cheer at Dotty's! What’s not to love about Christmas? Well, at Dotty’s we go all out and would love you to come and join the fun! 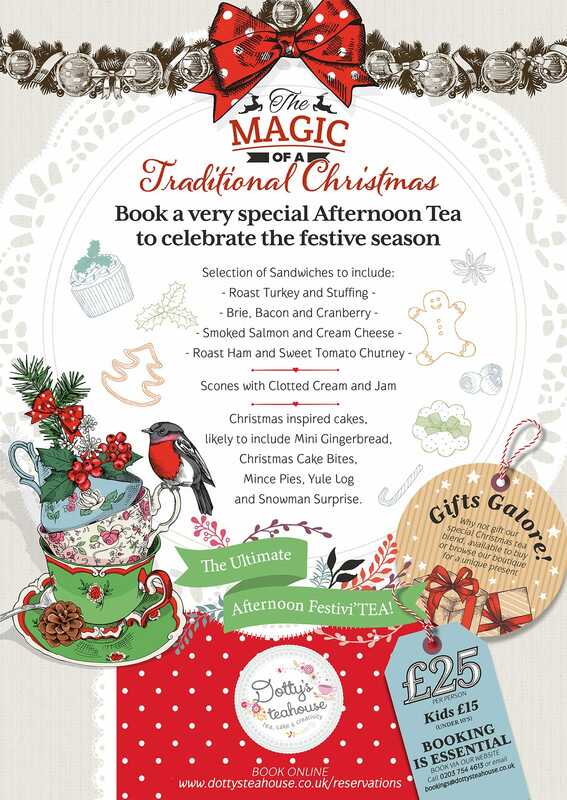 From crafty Christmas workshops to sumptuous festive afternoon teas we will get you in the mood! We are very pleased to be a really busy Teahouse and hate turning people away. To avoid disappointment please book a table before arrival. BOOKING IS ESSENTIAL FOR OUR AFTERNOON TEAS AND REQUIRES A 50% DEPOSIT. We will be in touch to confirm availability. Sign up to our newsletter There’s always lots going on at Dotty’s so be sure to sign up, we’ve even been know to give away cake every now and again!